Fusion Salmon Niçoise Salad: A great recipe for entertaining! I think most would agree that all salads are not created equal. My first encounter with a Salade Composée was in Paris many years ago and I was blow away by the presentation of each delicious, carefully-chosen element arranged thoughtfully on the plate. I love making salades composées when I entertain. This Salmon Niçoise salad recipe comes from a friend and it’s one of my favorites. 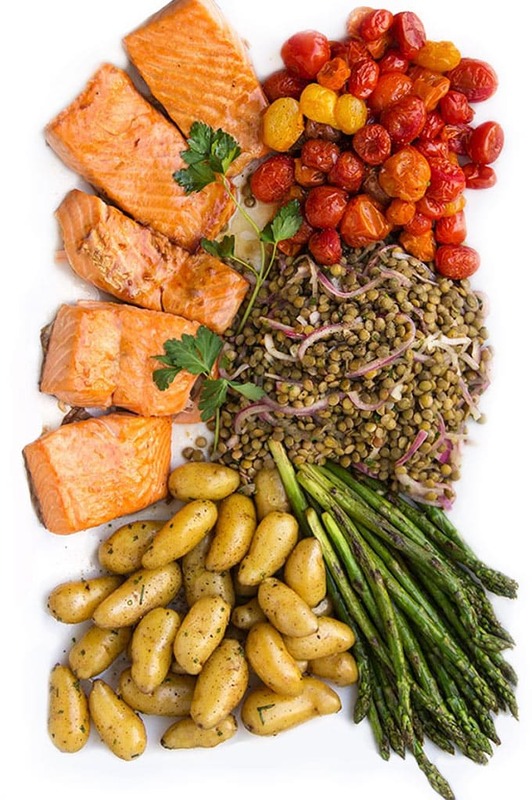 It has tender cooked salmon, lentils, potatoes, asparagus, and roasted tomatoes. Each element is wonderful on it’s own. 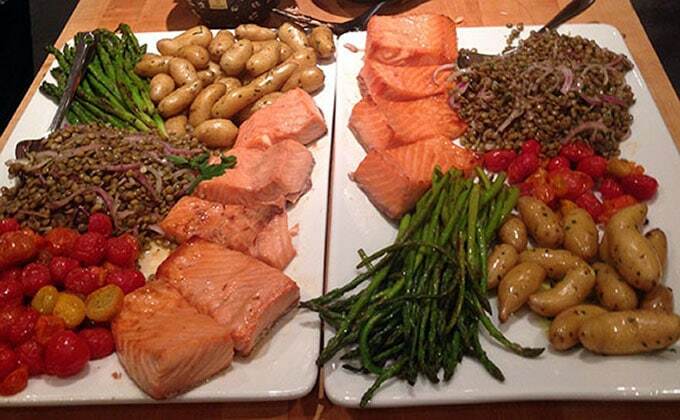 Put them all together and you’ve got a gorgeous feast. This is a fantastic recipe for entertaining because you can make everything ahead. I keep craving this Niçoise Salad… and making it… again and again. It all started last summer, when I visited my friend Ingrid at her home in Camden Maine. She prepared a meal that I loved so much – I had to recreate it at home: salmon niçoise salad and a rustic fresh cherry tart (I blogged about the tart back in July). Here’s a photo of Ingrid’s salmon niçoise, taken with my iPhone. 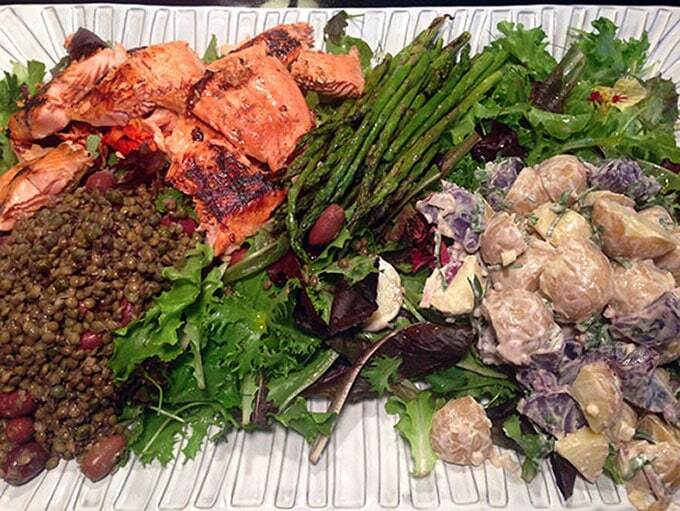 She grilled the salmon and tossed a mix of purple and white potatoes with a creamy vinaigrette. There were pencil asparagus on the platter, along with a pile of delicious lentils, lots of salty black olives and a lightly-dressed mesclun salad. 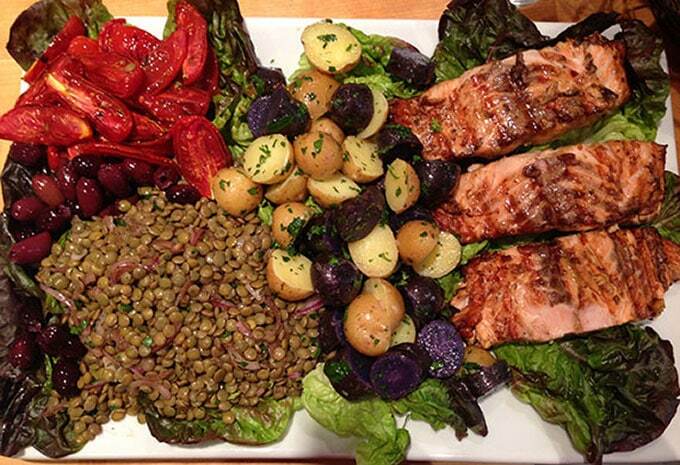 I’ve since enjoyed many similar meals, modeled after Ingrid’s salmon niçoise – like this one with grilled salmon, purple and white potatoes, lentils, and roasted roma tomatoes. As I said, I’ve made it again and again, but I won’t bore you with too many photos. Here’s the most recent version, that I made a couple of weeks ago, for a casual Friday night gathering with friends. The dish, as you see, is very adaptable. Roast whatever tomatoes look the ripest and sweetest. Choose small potatoes or cut up big ones. Toss them while they’re still hot, with olive oil, salt and pepper. You can add some finely chopped shallots, too, if you like. Then add chopped herbs once they’ve cooled off a bit. Pick any herbs you like – chives are my favorite. 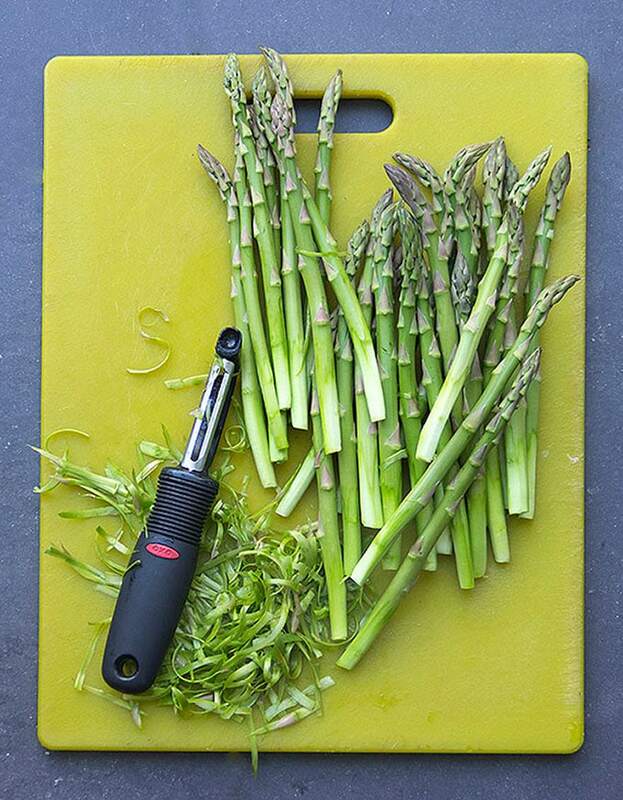 Steam or sauté the asparagus. Or choose another vegetable or mesclun salad with a lemony dressing, like the one I use for my classic Salad Niçoise. Grill or broil the salmon. In this version, I use a simple but delicious Asian-inspired marinade, and a broiling technique that results in deliciously tender salmon. You can make it up to a day ahead and keep it in the fridge until you’re ready to assemble the Niçoise Salad. For the lentils, I took some inspiration from one of my favorite chefs – Yotam Ottolenghi. 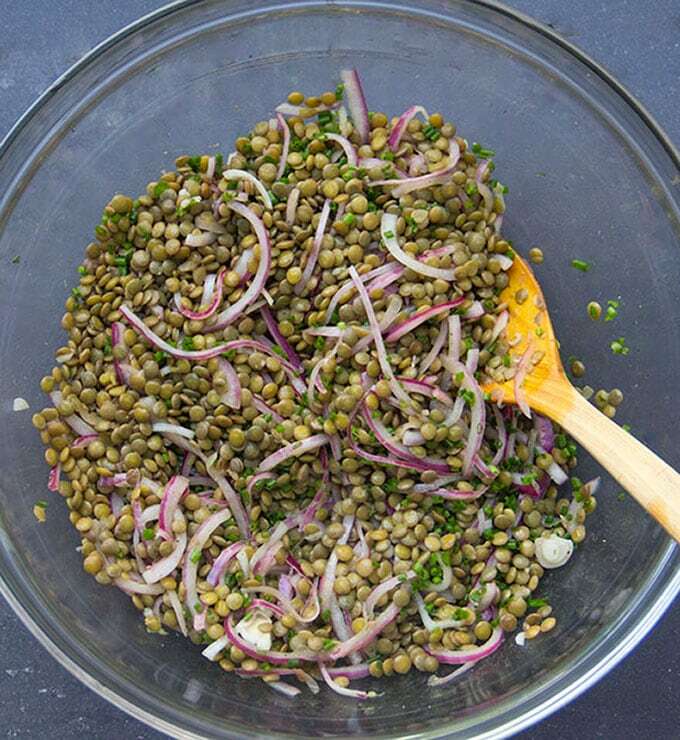 It’s a simple but delicious preparation of cooked lentils, mixed with thinly sliced red onion, red wine vinegar, garlic, salt, pepper and herbs. This is the kind of meal that makes me happy – it’s got so many exciting things going on and they’re all healthy and delicious. 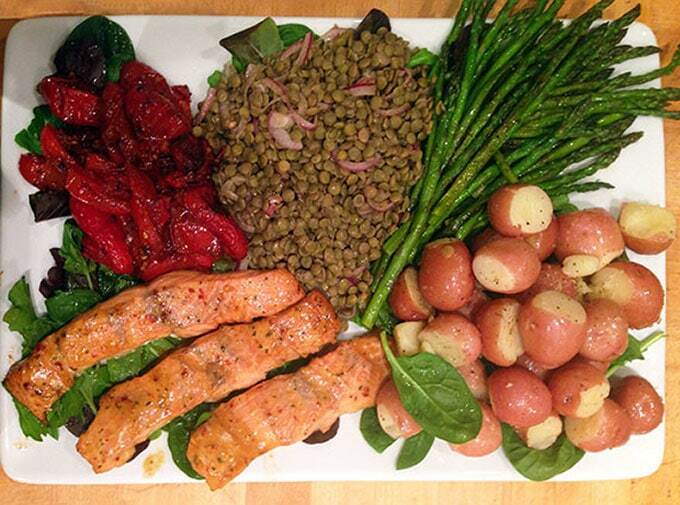 Here’s the recipe for Fusion Salmon Nicoise Salad. If you try this recipe I hope you’ll come back to leave a comment. I’d love to know what you think! 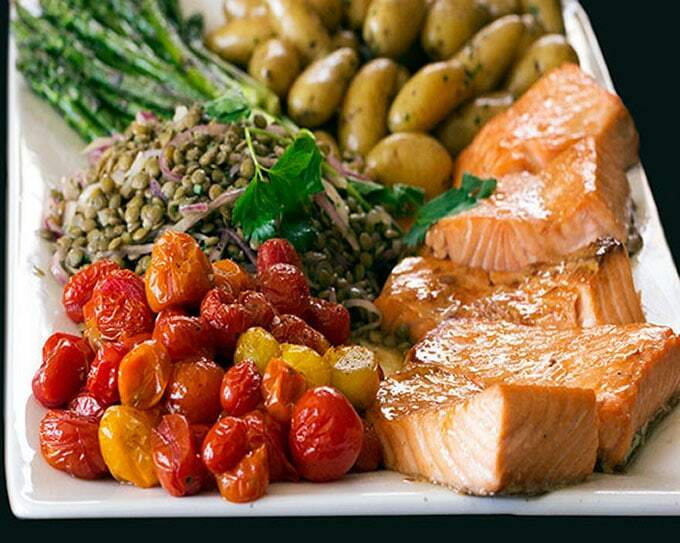 Composed salad of broiled salmon, lentils, potatoes, asparagus and roasted tomatoes. You can make it all ahead and serve at room temp. Perfect for lunch, brunch, dinner and entertaining. 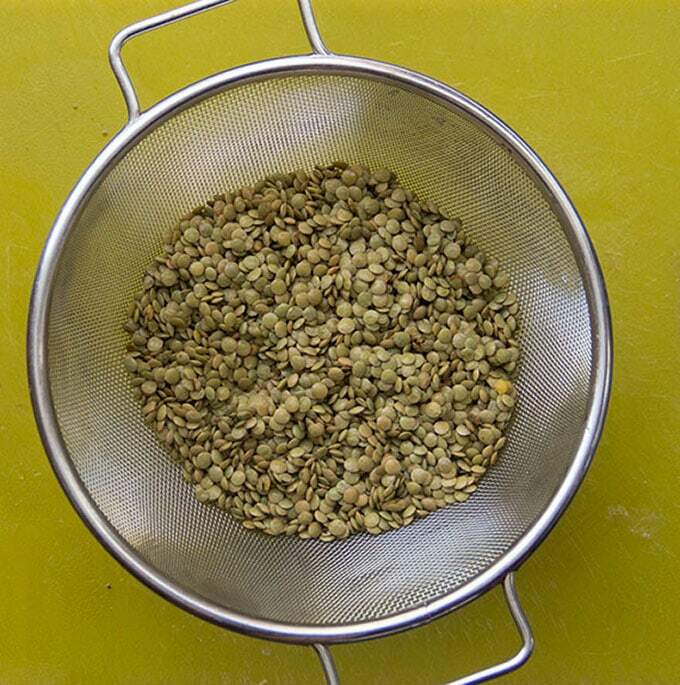 1 1/2 cups green (sometimes called brown) lentils, rinsed and picked over. 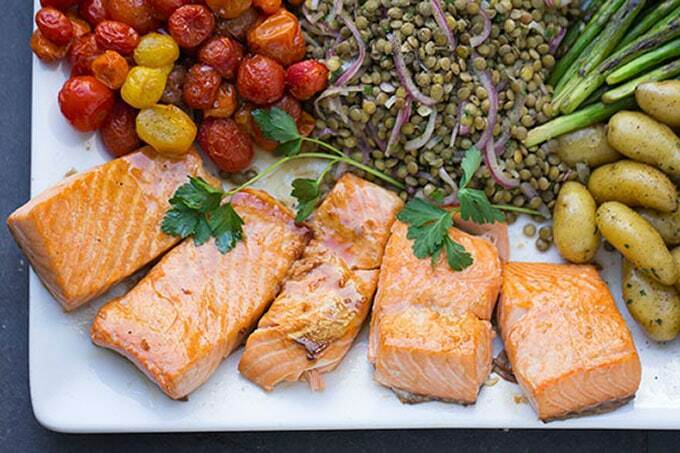 Marinate the Salmon: Mix the marinade ingredients. Put the salmon in a non-reactive container, just large enough to hold it in a single layer. Pour marinade on top. Marinate for 1/2 hour at room temperature or up to 24 hours in the fridge. 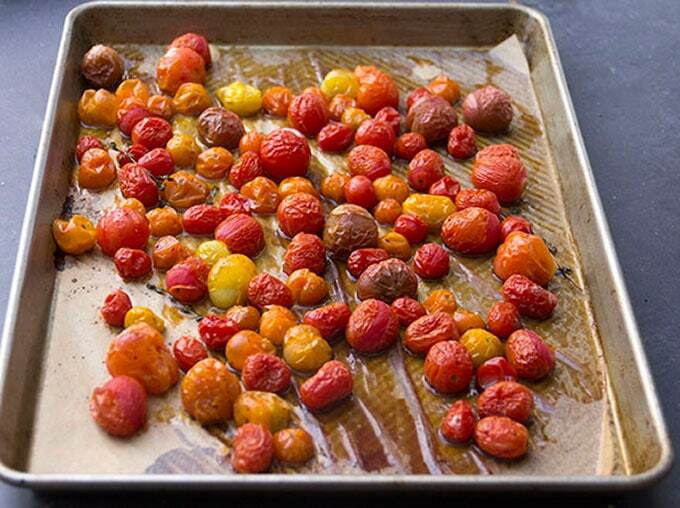 Roast the Tomatoes: Preheat oven to 400ºF. 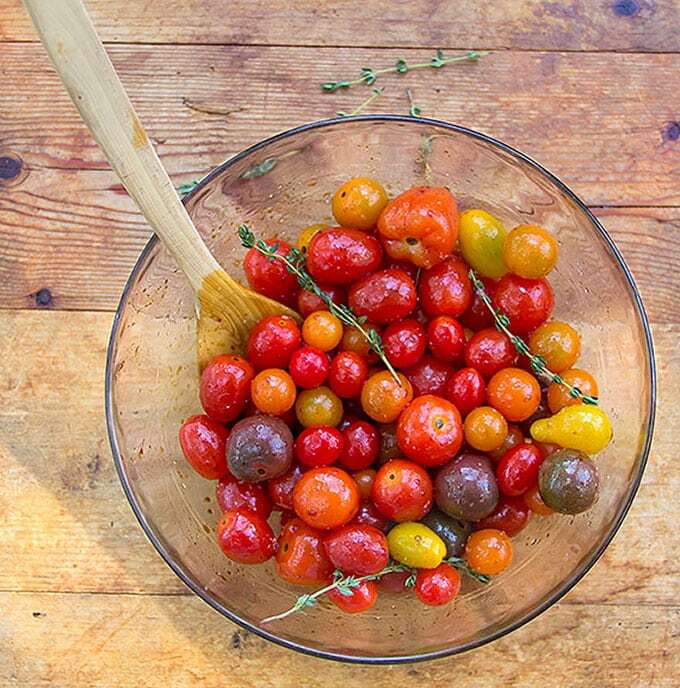 In a large bowl, toss the tomatoes with oil, balsamic, salt and pepper. Line a jellyroll pan with parchment paper. Spread tomatoes out on top. Toss on thyme sprigs, if using. Roast tomatoes for 25-30 minutes, until they soften and their skins split. Remove pan from the oven and set aside. 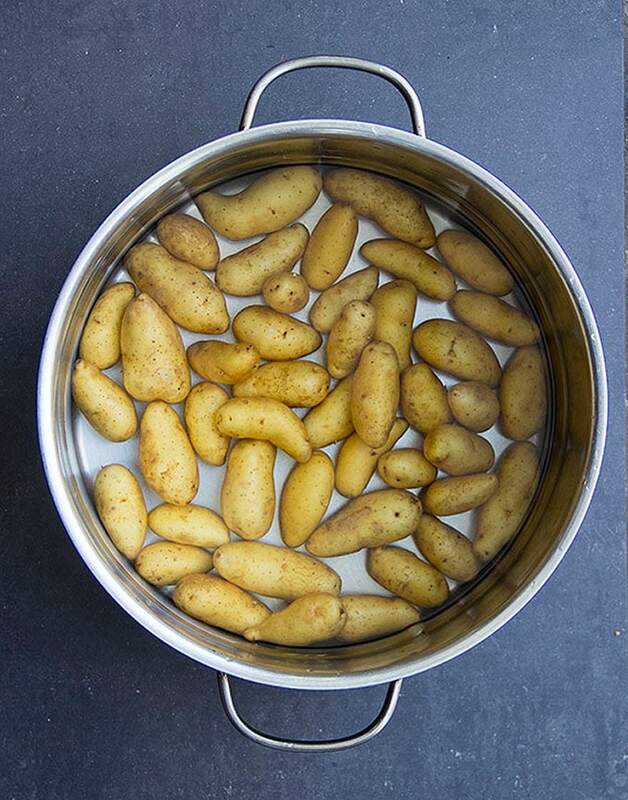 Cook the Potatoes: Put potatoes into a large pot, cover with water by an inch or two, and turn the heat to high. As soon as the water comes to a boil, set the timer for 10 minutes. 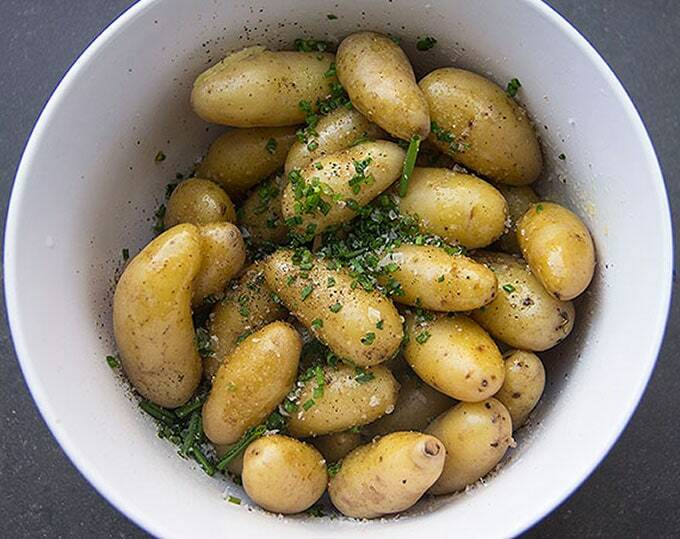 Check potatoes for doneness – they should be cooked but still firm. Drain potatoes. Toss them while hot, with olive oil, salt, pepper, and shallots, if using. Add herbs once they cool. 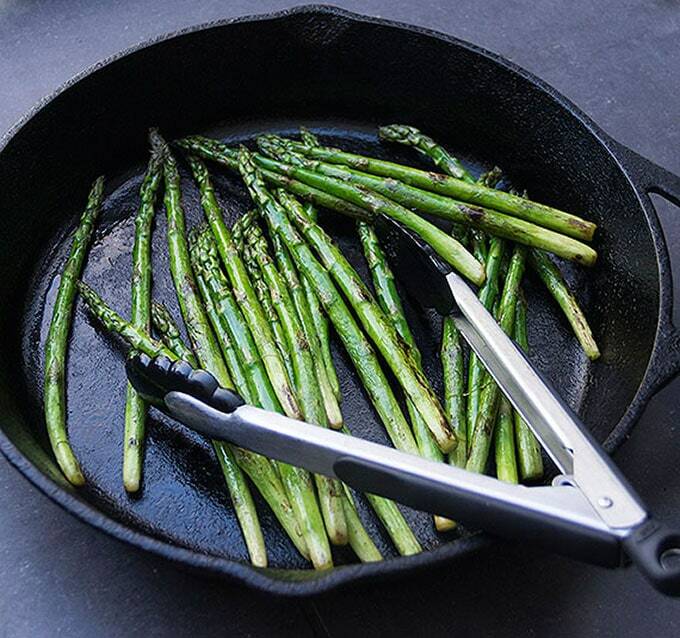 Saute the Asparagus: Coat the bottom of a large heave skillet (cast iron is best) with 1 tablespoon olive oil. Turn the heat to medium high. When the oil is hot add the asparagus. Cook, tossing frequently, until they are cooked but still firm, about 6 minutes. Note: for very thick asparagus brown them for a few minutes and then add 2 tablespoons of water, cover the skillet, and let the asparagus steam for 5 minutes or so, until they are cooked through. Transfer asparagus to a plate and set aside. Broil the Salmon: preheat the broiler. 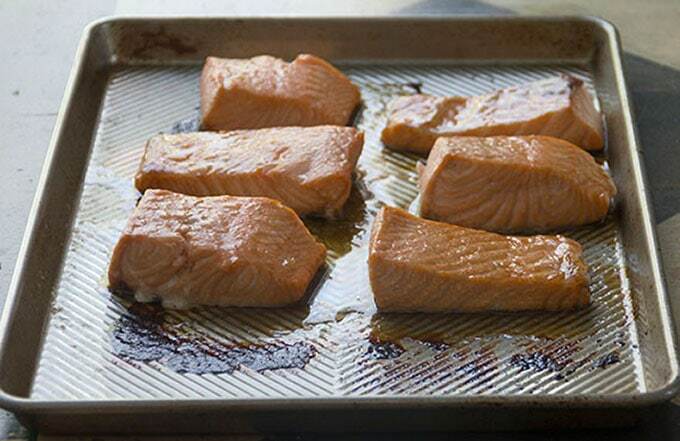 Take the salmon out of the marinade and place it on a baking tray, leaving space between the pieces. Cook salmon for 6 minutes. Remove tray from oven and put it on the stove top or another heat-proof surface. Quickly tent the salmon with foil, fastening the foil to the edges of the pan to keep the steam in. Let the salmon steam for 10 minutes. Then transfer it to a covered container, if making ahead, and keep it in the fridge for up to 24 hours. 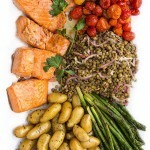 Assemble the Salad: Arrange the salmon, lentils, tomatoes, potatoes, and asparagus on a large platter. Enjoy! Hi! Made this for a group of 11 the other night. Everyone LOVED it so much and what I loved was the ability to make it all in advance. GREAT party meal! Thank you! Have just bookmarked this for a dinner I’m serving to friends on the 25th. Can’t wait. I am LUSTING after this salad. I agree with Rachel—the colors just pop. What array of textures and flavors too!!! Holy Moly this looks amazing! I’m a big fan of nicoise salad, so I love all the variations you showed and can’t wait to give them all a try. I’m always trying to eat more fish and salad, so this looks like the perfect combination and even appeals to my winter comfort food cravings! Oh, I do love the way the colours pop on this dish – asparagus season has finished here but everything is good so think I will make this with green beans (which are great at moment) instead. Thanks Lisa.